The inevitable launch of Google’s new personalized search has stirred up a lot of discussion on how Google broke the Internet, made its search engine inferior to Bing, screwed over Twitter etc. Wow, were there people in the tech industry that didn’t know this was coming? Perhaps these have been the same people who’ve declared Google+ a failure over and over again. Even the fastest growing social network is not enough in a world that has Facebook. And even if there would be tens of millions of registered users for the service already after a few months, at least they weren’t using this “ghost town” of a network (see the discussion around #aavekaupunki in Finnish). Yeah, it can only be a failed attempt from the Mountain View engineers to build a Facebook clone, since that is the gold standard of social networking that every other contender must be evaluated against. 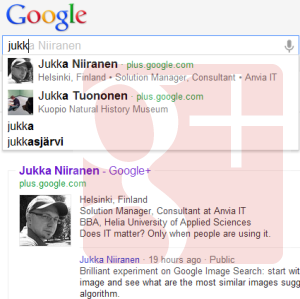 To all those people surprised about the launch of Google “Search Plus Your World” with integration to Google+ profiles, circles and posts, I’d like to present the following question: did you think for a moment that Google was not going to leverage it’s core competence (search) in the social network it was building? Vice versa, was it not blatantly obvious right from the start that the company would utilize this new social data source it has unlimited access to (G+) for improving the relevancy of search results? Ok, enough of the “my network is better than your network” wars. For the end user there’s precious little significance in which US based company is luring in the biggest number of status updates per second. What we ultimately want is for the creation, sharing, discovery and consumption of relevant information to be as convenient as possible, so the question is: what can I get out of a social search engine that wasn’t possible before? 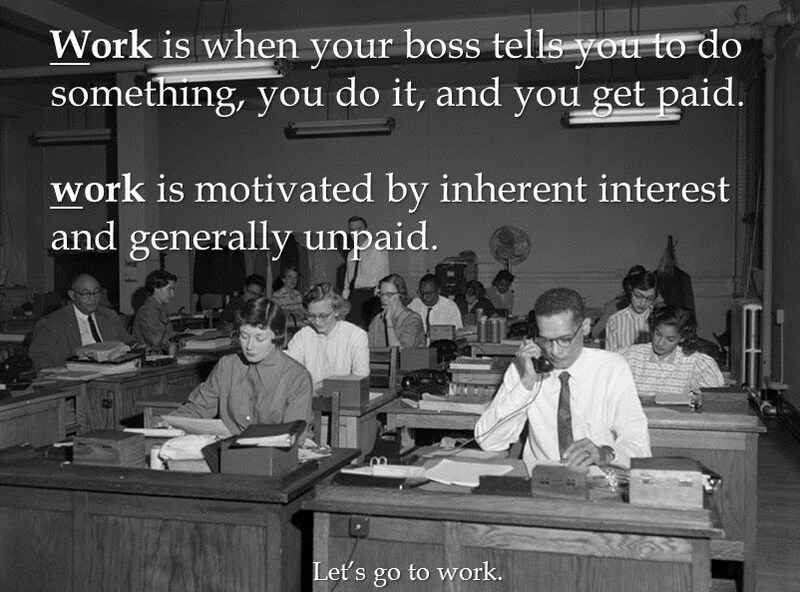 Work is when your boss tells you to do something, you do it, and you get paid. 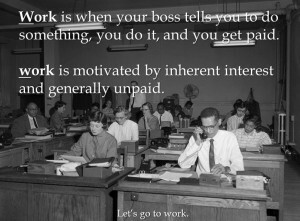 work is motivated by inherent interest and generally unpaid. It turns out I had actually already posted an article referencing the very same speech 11 months ago, only I didn’t have any recollection of it. It was on my Posterous “blog” that I’ve used mainly as a public noteboard of interesting articles I come across regarding knowledge work. Due to the ultimate simplicity of Posterous, it’s very quick to compose an email with quotes, images & links, send it to the Posterous email address and see it turn into a blog post, which is why you don’t need to spend much time thinking about the topic itself. A noteboard is only useful if you know to go and read its content, which is what I didn’t know. But Google did. Ok, the result in the example is most likely taken from a tweet rather than a Google+ post, since that didn’t exist last February yet. The point is not really about Google+ itself, rather it serves as yet another reminder that the web knows you better than you do. Instead of being frightened of the privacy implications, what I would recommend everyone to do is to make the most of it – exploit the intelligence of the machine that we’ve all helped to build. Related artists. Who to follow. Recommendations based on your browsing history. The Web has to be working for us, not the other way around. For example: in a world of personalized search, is there any longer a need for social bookmarking á la Delicious? Why should I bother saving links into my own list on a separate point solution like Delicious, when I might as well share the link to my followers/circles/friends/whatever and trust that the system will bring it up if I ever need it again? Trying to come up with descriptive tags for links all on my own seems like a futile attempt compared to the power that the networked online society can have on building relevancy for the shared content. To continue on the thoughts expressed by Shirky, sharing is work, but not Work, as it feels inherently like the right thing to do and requires effort, yet you don’t get paid for it. “Big Work drives the economy, little work drives the Internet.” It took around 100 million hours to create all of the content on Wikipedia, but thanks to the evolutionary nature of social technology and the network effect, the next Wikipedia will most likely take only a fraction of those hours. It has to, and we really shouldn’t settle for anything less. It is therefore imperative that the tools being built by companies operating in the realm of IT, be it the Google Goliaths or the start-up Davids, strive to make the most of what the collective little work of the online population has already built, because that is the best way to foster motivation of workers (with a lowercase w). This motivation, in turn, will be more and more in demand as the human civilization is facing problems that its capitalist system is not very good at solving. The little work can go a long way. As what comes to the search engine business that built Google / Google built (any which way you want to look at it), we’ve already seen signs that indexed search has peaked. The way we used to search for content is on the decline, and if Google would be sticking to what they do best now, fighting against the next big thing, they would be standing on the deck of a sinking ship. You could well blame them of being hopelessly late to the game of social, but based on what I’ve seen from them during the past year, I wouldn’t count them out just yet. The reason is, I believe we don’t yet have nearly enough tools for social technology to make us as smart as we could be. Right now we have the infrastructure in place for networking with people and sharing content. That’s a good start and it’s been a big enough revolution on its own to fuel the stellar rise of services like Facebook and Twitter. However, if we’d just continue on the same path of ever increasing tweet counts, would we end up becoming increasingly smart or rather end up in the lunatic asylum? If we look at the content search functionality offered by Twitter (basic keyword search on less than a week’s worth of data) or Facebook (absolutely none! ), it’s easy to see that the game has only just begun on developing content relevance and discovery algorithms that deliver real added value over simply consuming an ever growing feed of data. While social media has brought us new strategies to overcome information overload through relying on recommendations and content sharing by people we know/trust, this won’t scale indefinitely, and it is in fact quickly contributing to the very problem it once promised to solve. In order for us to keep getting smarter through social networks, the filters available to us will need to get smarter first. 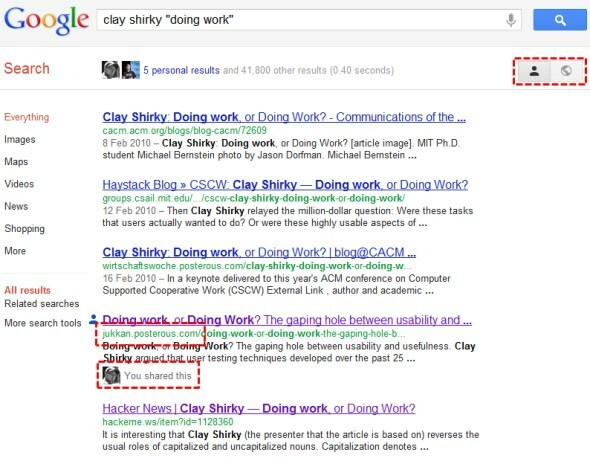 The question is: can Google produce the missing UI needed for harnessing the true power of social networks? And if not Google, then who? Tagged with blogging, crowdsourcing, facebook, Google, privacy, search, sharing, SocialMedia, Twitter.